Tulum Mexico has been on one of the hottest beach destination radar for awhile now and for good reason. With a gorgeous stretch of beach, fabulous resorts, incredible food, and a laid-back hippy vibe that gives you all the feels. Besides being a resort town, Tulum also has a cool chic personality to it making it one of the Mexican Caribbean’s hottest destinations for visitors. After a few years of being on our wish list, we finally made it to Tulum ourselves and see why so many love it. We’ve put together our top picks and guide for best things to do in Tulum Mexico to help you plan your trip. You wouldn’t be coming here if you didn’t want to hit up the beaches as they are the best thing to do in Tulum Mexico. With sand that looks and feels like powdered sugar and gorgeous blue water, you can’t help but be awestruck when you’re in Tulum. Even though during our visit there was a seaweed attack with tons of seaweed washed up on shore, the beach was still beautiful. We recommend taking full advantage of the beach while you’re here. Whether it’s lazying on a beach blanket all day or hanging out at places like Papaya Playa or Villa Pescadore (both mentioned in our best food spots below) where you can order food and drinks all day while sunbathing on one of their beachside beds, tables, or cabanas you can’t go wrong. Don’t forget to check out Playa Ruinas beach when you’re visiting Tulum Ruins or if you’re doing a day trip to Sian Ka’an ask your driver to stop at the Secret Beach for a slice of paradise all for yourself even if only for a few moments. Check out this guide to Tulum Beaches by The Travel Lemming for more inspiration. 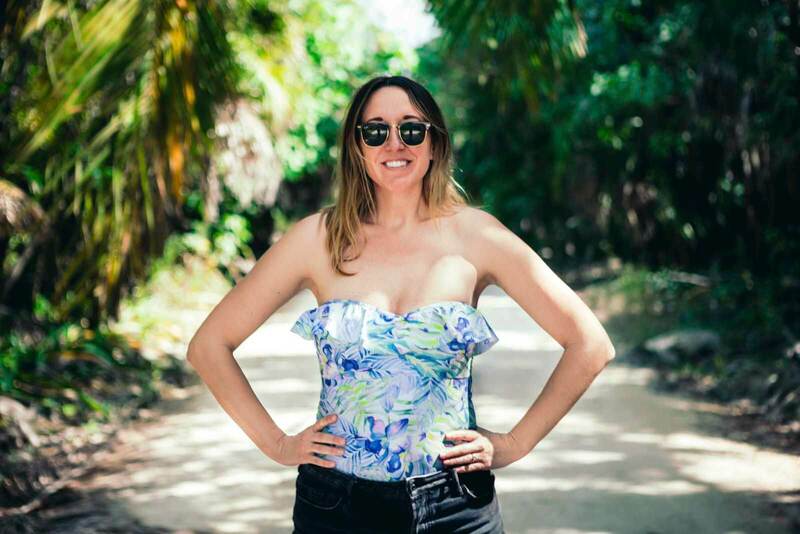 There is some ahhhmazing shopping in Tulum for the female traveler specifically and easily one of the best things to do in Tulum if you love shopping like I do. Along Avenida Tulum, the road along the beach connecting to all the beachside resorts, you will also find tons of boutiques offering up the latest in chic boho fashion, Instagram worthy accessories from cover-ups to inflatable rafts, and even boho home decor to take back with you when you’re done with your vacation. The boutiques remind me of what we’d see walking downtown in Laguna Beach, one of California’s most artsy beach neighborhoods with a laid-back vibe filled with adorable shops as well. Also, the prices remind me more of California than they do of Mexico. Be prepared to spend US boutique prices in Tulum, that goes for almost all of Tulum actually. If you have that in mind the sticker price won’t shock you and you can enjoy shopping for amazing handmade jewelry, hand-woven purses and straw hats, caftans, swimsuits, dresses, and more. One of the best things to do in Tulum Mexico is taking a day trip to the Sian Ka’an Biosphere Reserve, a UNESCO World Heritage Site and the largest protected area in the Mexican Caribbean. Witness some of the most beautiful clear blue waters we have ever encountered on our travels, wild dolphins, giant sea turtles, wild birds, and snorkel through the second largest reef system in the world. While the ride to Punta Allen isn’t the easiest and shouldn’t be done in your rental car unless you have a 4 wheel drive vehicle, it’s worth the journey. This ended up being the highlight of our trip to Tulum because of all the wildlife we encountered and the incredibly blue water we experienced on our 3-hour boat tour. 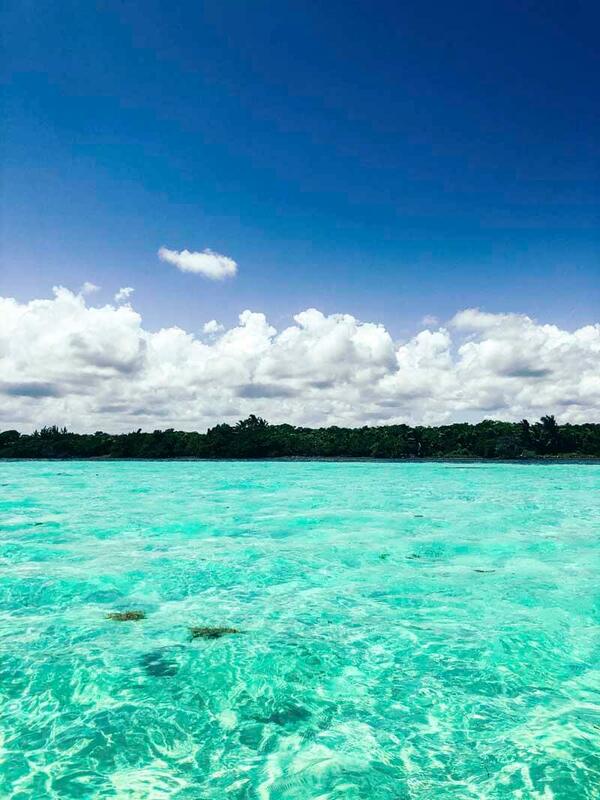 Once you arrive at Punta Allen you will either hire a boat or if you’re on a tour, which we recommend, you will be taken on a boat for a three-hour tour. 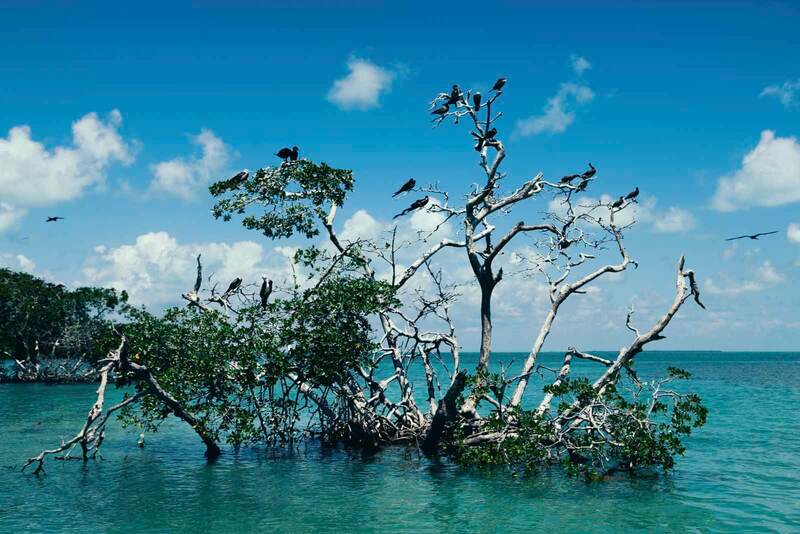 You will get to see as much wildlife as possible while stopping for snorkeling in the Belize Barrier Reef and stopping at the shallow idyllic blue water where you can lazily float and enjoy the incredible beauty around you. 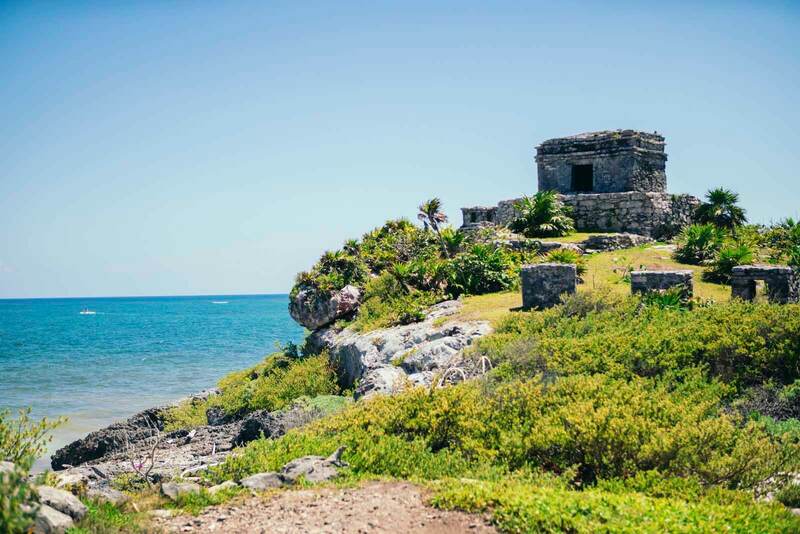 We recommend booking a tour as visiting Sian Ka’an on your own requires a lot of planning and work let alone the long, bumpy drive that you won’t be advised to do in a rental car. The tour includes hotel pick up and drop off lunch, drinks, guides, snorkeling equipment, and entrance fees. Book your Sian Ka’an day tour here. One of the best things to do in Tulum Mexico, or actually the entire country is eat real Mexican food. We have both agreed that Mexican food is our favorite type of cuisine and we both think we could never get sick of the fresh ceviche or tacos here. 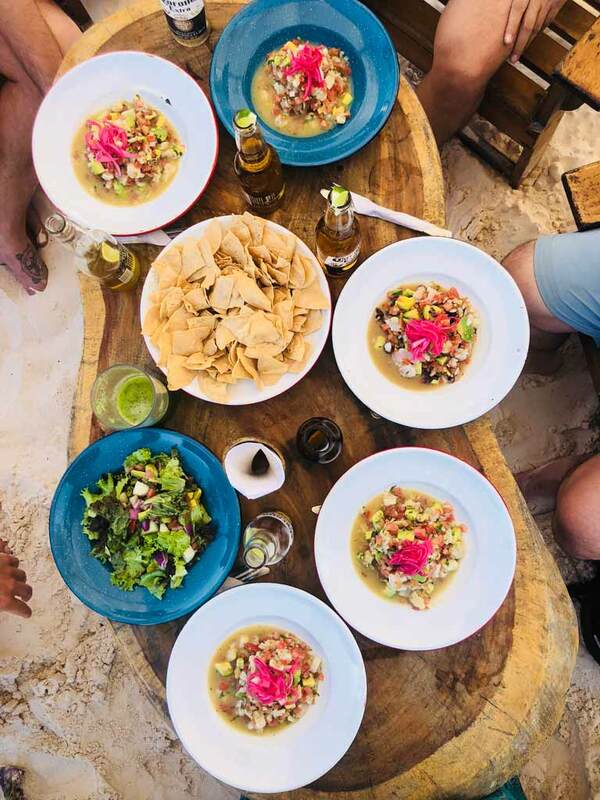 Tulum is loaded with amazing places to dine, however, we only had so much time to sample around so we are only going to mention the few that we thought were stand out experiences from our personal trip. One of our favorite things that we did in Tulum was the Dining Experience. They have a few different locations around the globe and we were lucky enough to try out the one in Tulum. This dinner experience lasts around 3 hours and is a really fun time! You get to know your hosts and other guests as you sip on unlimited local cocktails and cuisine. The entire meal is an experience and it’s unforgettable! From the history of the dishes, a Mayan ritual, salsa dancing, and learning the proper way to eat a taco our entire group left feeling like that was one of the most fun nights out at a restaurant. 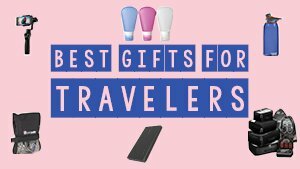 This is great for solo travelers, couples, groups, and really anyone. However, it is an adult only experience so if you have the kids along try to get a babysitter for the night! Not located on the beach but worth mentioning is El Camello in town. One of the best things to do in Tulum is enjoy the seafood! This seafood restaurant is open until 10 pm and serves up fresh seafood at great prices. Since it’s not located right on the beach this was a breath of fresh air when our bill came to the table. Scott and I both ordered different ceviches and the portion sizes were HUGE compared to everywhere else and much less expensive. We could have easily split a small, luckily they had take out containers and we ate the rest for lunch the next day. This place is a great value as well as serving up some tasty seafood and this no fuss, locals only vibe restaurant. Located right on the beach just walking distance from the Tulum Ruins in Villa Pescadores. This spot is great because you can enjoy lunch right on the beach in either one of the tables or the beachside beds. Most places like this with prime ocean front real estate make you pay a small fortune to use up one of their seats, but Villa Pescadores doesn’t! Besides not charging you a minimum per head, they serve up AMAZING seafood and ceviche! We loved the location, the food, and the drinks here and highly recommend this spot for lunch. Another one of the best things to do in Tulum because it’s right on the beach is hanging out all day at Papaya Playa and eating lunch. We recommend this spot only during the day as the beachside tables close up around 5 pm. There’s a minimum spend of 500 pesos per person which is easy to do since their drinks and food are moderately priced. If you plan on hanging out on one of the beachside beds all day you can only order ceviche, which was no problem for us! They have several flavors and they were delicious! If you want to secure your spot on the beach call in a day early and make a reservation. We had a few empty beds next to us all day. What we loved the most about Papaya Playa was not only was the food delicious but it was on a less crowded section of Tulum Beach. Check out this incredible food and restaurant guide to Tulum by Foodie Flashpacker. One of the best things to do in Tulum Mexico during your visit is to visit the ancient Mayan ruins. The Yucatan Peninsula has some of the most impressive Mayan ruins in the world so it would be a shame to not at least see one while you’re here and luckily for you being in Tulum you’re close to some of the most incredible ruins on the peninsula. Located right along the beach in Tulum Mexico are the Tulum Ruins which are some of the most beautiful ruins in Mexico specifically for its location on a cliff overlooking the white sand beaches. The ruins are well preserved and date back to as early as 564 AD. When visiting you even have access to the beach attached to this archeological site. As you roam the site you can see iguanas of all sizes basking in the sun or climbing through the ruins. You can’t actually climb the ruins here but you can surely enjoy the views and beauty of this historic site. It costs 40 pesos to visit the Tulum Ruins. Drones are prohibited at all archeological sites in Mexico so don’t even bother carrying one even if you don’t intend to fly it there, they won’t let you in. They also do not let you carry tripods into the ruins. Just around a 45-minute drive from Tulum Mexico are the ancient Coba Ruins dating back to as early as 100 AD. 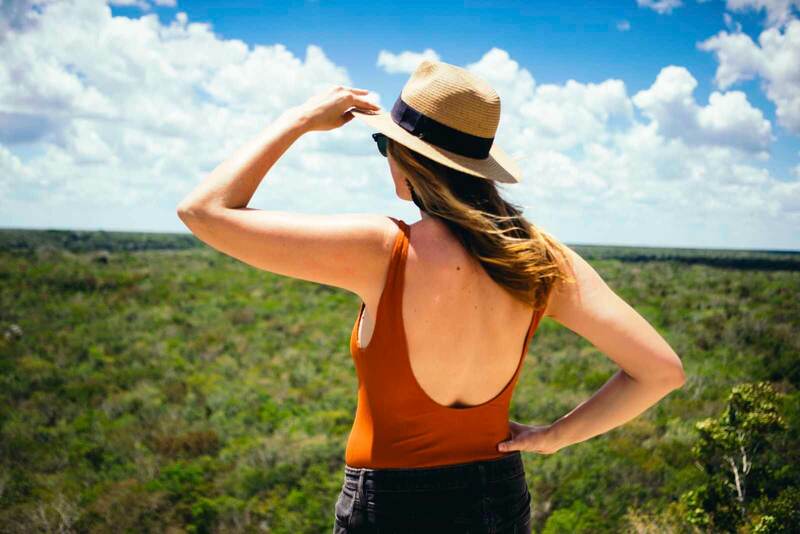 This is one of our top picks for things to do in Tulum if you want to take a quick day trip to see Mayan ruins and also enjoy some of the cenotes that are a bit outside of Tulum. 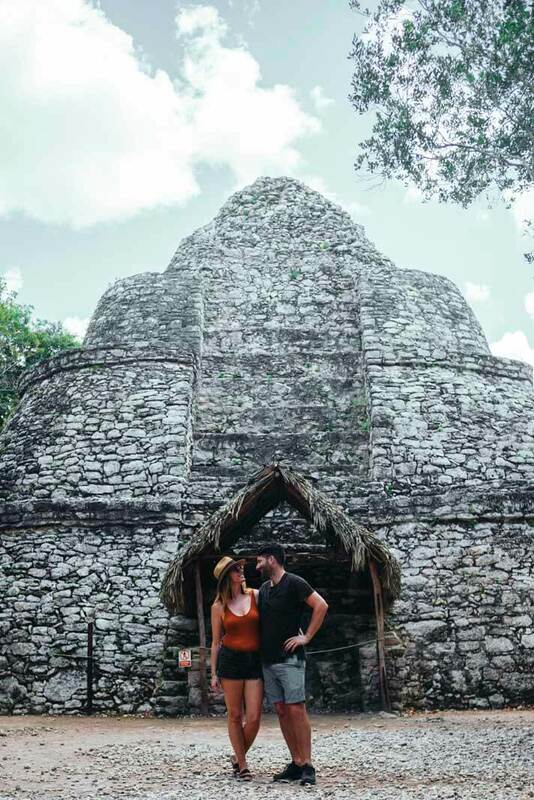 The actual ruins at Coba won’t necessarily blow your mind in size, but what ended up making this one of our favorite ruins to visit is the location of the ruins. They are nestled in the jungle and require you to either walk, bicycle, or ride to the ruins on your own personal man operated bicycle tuk-tuk chariot. We highly recommend the bicycles. Riding from site to site through the jungle on the little dirt paths was absolutely gorgeous. Since Coba are a bit removed from the coast you can enjoy the ruins without hoards of people as well. You can climb the largest pyramid, Noohoch Mul and look over the top of the jungle which is a canopy of lush green as far as the eye can see. It costs 70 pesos per person to enter plus 50 pesos if you decide to rent a bicycle inside or 120 pesos to share a 2 person chariot operated by a local. Again, no tripods or drones allowed inside. If you want an even less crowded Coba you can come visit in the evening hours between 4:30- 7:00 pm for an unforgettable experience. The admission for the twilight hours are slightly higher at 240 pesos a person, but we’d love to come back and gladly pay it to try it. Tip: be sure to bring insect repellent as you will be in the jungle where there are mosquitos! Also, if you do not have a rental car to drive to Coba yourself you can catch a bus from Tulum or hire a taxi for the day. 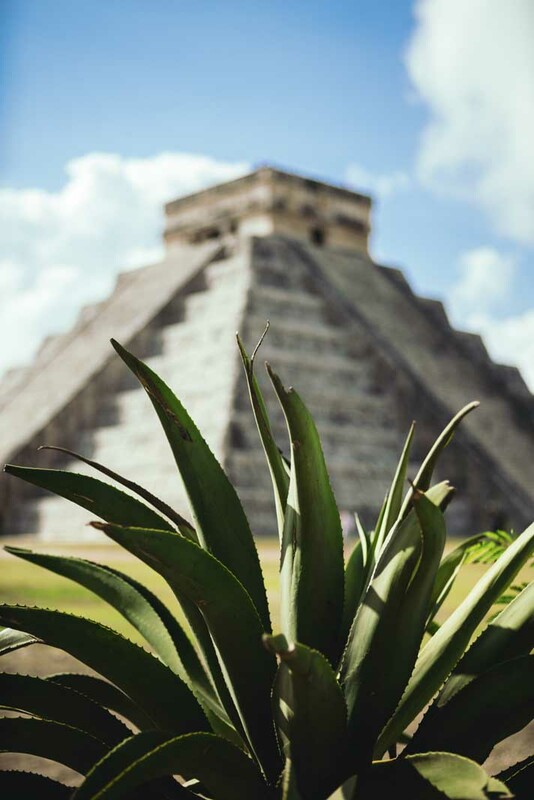 Another one of the best things to do in Tulum is to take a day trip to see Chichen Itza, one of the new seven wonders of the world, UNESCO World Heritage Site, and arguably the most famous of the Mayan ruins in the world. 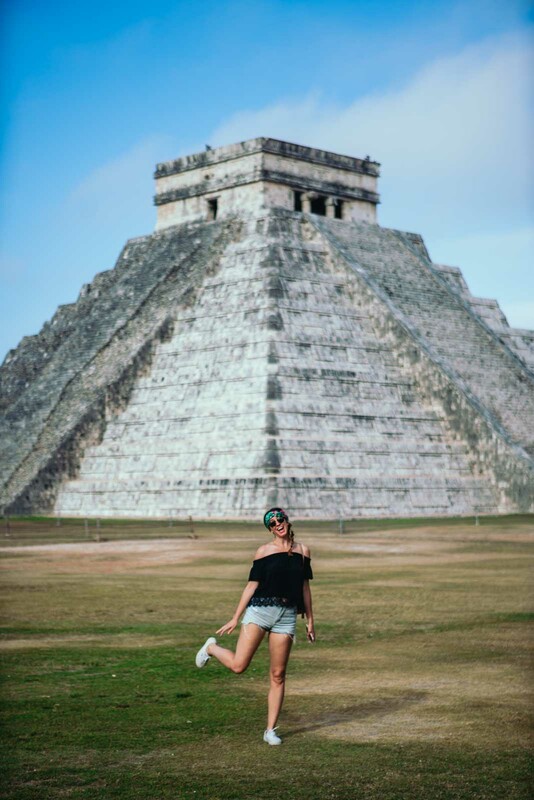 About a 2-hour drive from Tulum you will want to start your day trip early and try to get at Chichen Itza at 8 am when the gates open so you can enjoy this famous archeological site before the crowds and the heat of the day kicks in. The most impressive site here is El Castillo or Temple of Kukulcan, the famous massive step pyramid you’ve seen in your history books. Take your time walking the complex and taking it all in. You will need to purchase two tickets here for admission totaling at 242 pesos per person. If you are paying by credit card you will have to make two separate transactions. Be sure that you have both tickets before leaving the ticket window to avoid having to get back in line for the second ticket. 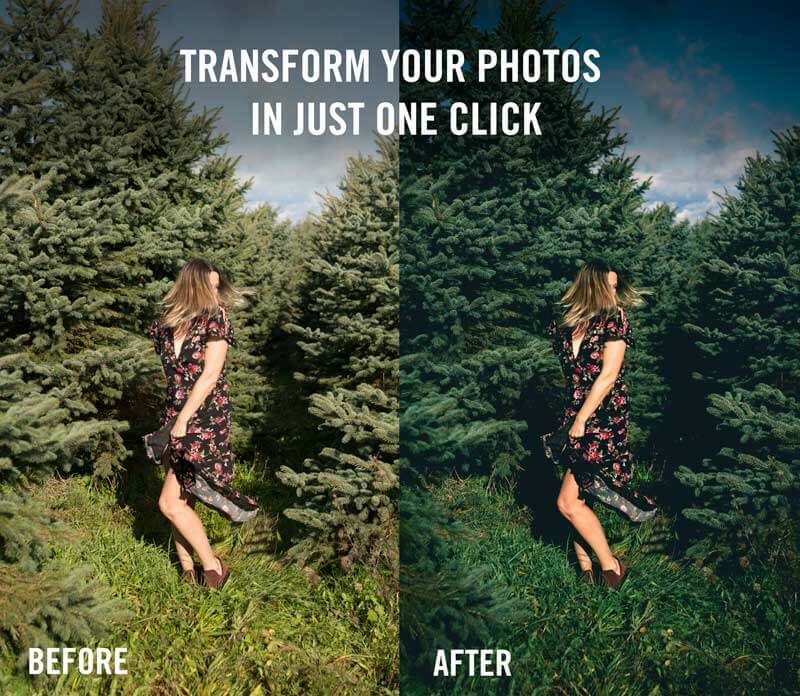 It’s a bizarre way of doing things, we know. Expect to pay 50 pesos to park if you are driving yourself. If you want to hire a guide to give you the history of Chichen Itza expect to pay 600 pesos. Don’t have a car to do these trips on your own? Don’t worry you can always book a tour. We recommend checking out this tour where you visit the Coba Ruins, Chichen Itza Ruins, and Ik-Kil Cenote all in one day. The tour includes hotel pick up, admission to all the sites, tour guide, and a buffet lunch. 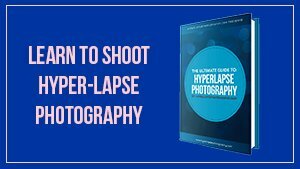 This is great for people who don’t have a lot of time to plan the trip themselves or people who don’t want to worry about driving in a foreign country. Book your Coba, Chichen Itza, and Ik-Kil Cenote tour here. One of the best things to do in Tulum Mexico and all around the Yucatan Peninsula is visit the cenotes, or underground sinkholes that are literally all over the place on the Yucatan. 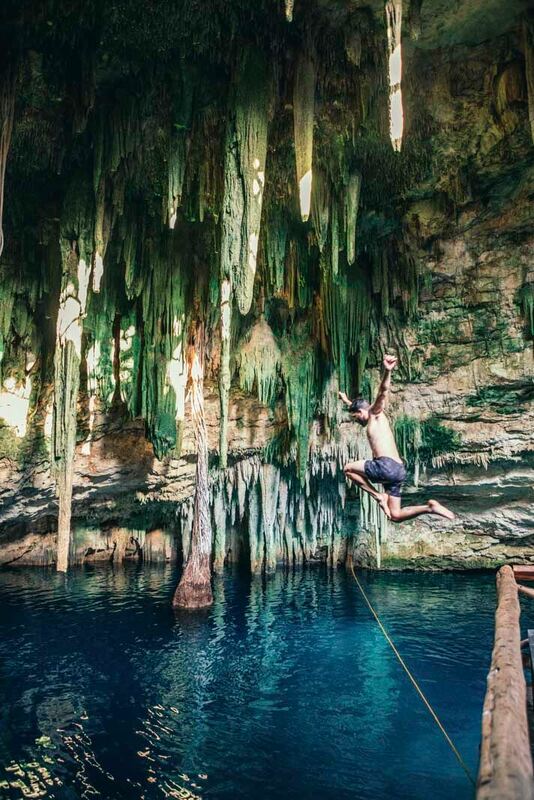 Cenotes are open to the public for swimming, diving, snorkeling, and some even have zip lines! There are a few different types of cenotes but most are either cave cenotes or open swimming pool cenotes with the most gorgeous turquoise waters. There are several cenotes you can visit, there are actually thousands and thousands of cenotes, check out this guide to cenotes by Food Fun Travel for more information on some of the best you can visit. We are just highlighting a few nearby Tulum, but there are many more that you could make an entire vacation out of visiting cenotes! 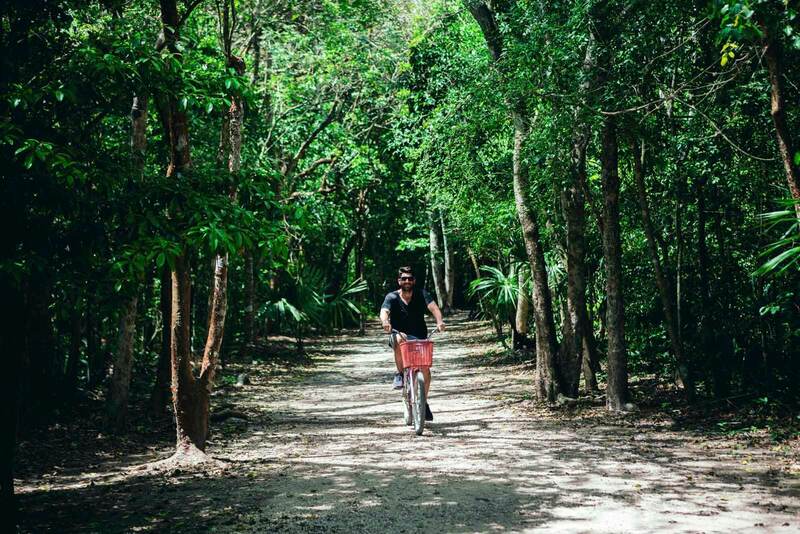 Located only about 15 minutes drive from Tulum Beach towards the direction of Playa del Carmen, Dos Ojos Park is one of the best things to do in Tulum Mexico if you’re looking for an all-day cenote excursion. There are a total of 7 cenotes here that you can visit, snorkel, and dive at. While the prices here are a bit steeper than the other cenotes, this location is great if you’re looking for a one-stop multi cenote experience. Please note: The prices have dramatically increased for Dos Ojos. We did our research online and many sources claim Dos Ojos is around 100-120 pesos, however, we were quoted 700 pesos even with a local to visit 2 of the 7 cenotes! You can always call ahead, maybe we were just getting ripped off because it was a holiday week! One of the most popular cenotes in Tulum Mexico is Gran Cenote! The cenote itself is large and can get very crowded. We recommend showing up early in the morning to have the place as empty as possible before the hoards of people show up. Part of the cenote is an open pool and part of it is in a cave. Choo Ha Cenote is less popular than the other two mentioned and one of the best things to do in Tulum if you’re planning to head to the Coba Ruins as well. Located near Coba, this cenote is located in a cave that you access via a staircase going underground! This cenote is one of the best things to do in Tulum Mexico if you have a family. This cenote is located in a park perfect for a day with swimming and a packed picnic. This cenote looked kid friendly and even had a zip line for only 10 pesos into the open turquoise swimming pool! Close to Tulum on the way to Coba is the Carwash Cenote. We actually laughed at the name because we thought it was just a car wash who just threw cenote in the name for fun. Nope, it’s an actual cenote with underwater caves and perfect for divers! Note: you cannot wear regular sunscreen into the cenotes as the chemicals are harmful to the environment. You will either have to shower off if you have sunscreen on and wear nothing or come prepared with biodegradable sunscreen. Biodegradable sunscreen is difficult to find once you’re in Mexico so be sure to purchase it beforehand, you can do so by clicking here. 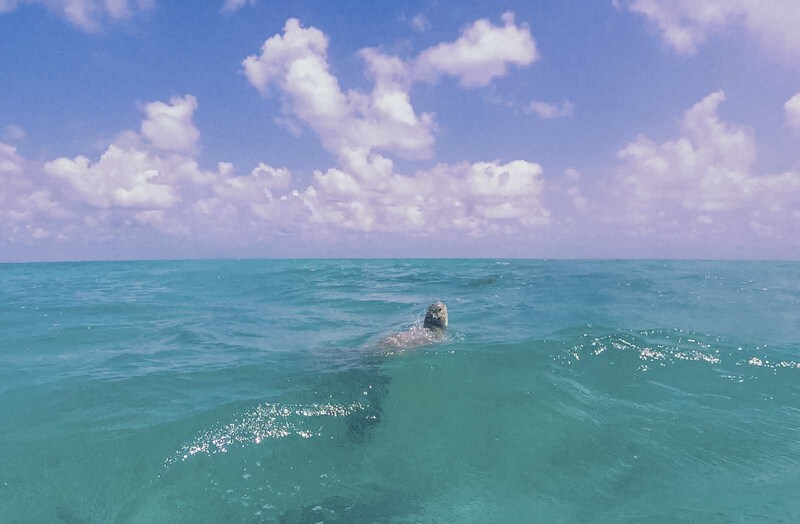 Another one of the best things to do in Tulum Mexico is head up the coast about a 30 minutes drive to Akumal where you can actually swim and snorkel with wild sea turtles! Bring your own snorkeling gear or go on a group tour, we prefer to do this activity on our own though. 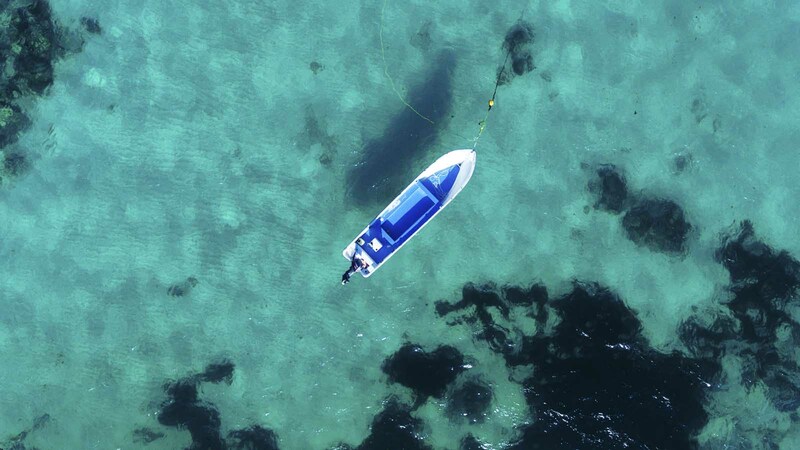 The area is ideal for snorkeling since the bay where you snorkel protects waves from crashing through with a reef. The sea turtles here are acclimated to seeing humans and while you can get pretty close without bothering the sea turtles be sure to use your better judgment and not touch or get too close as these are wild animals who deserve respect in their habitat. Now that we said that, this is one of the coolest experiences to have in person and highly recommend witnessing sea turtles for yourself in the wild! We highly recommend staying on the beach in Tulum, especially if you’re not planning on renting a car. There are many resorts and hotels on the beach. While Tulum is not as budget friendly as the rest of Mexico, you can still find accommodation that isn’t just for rich travelers. This is a great budget-friendly option right on the beach! 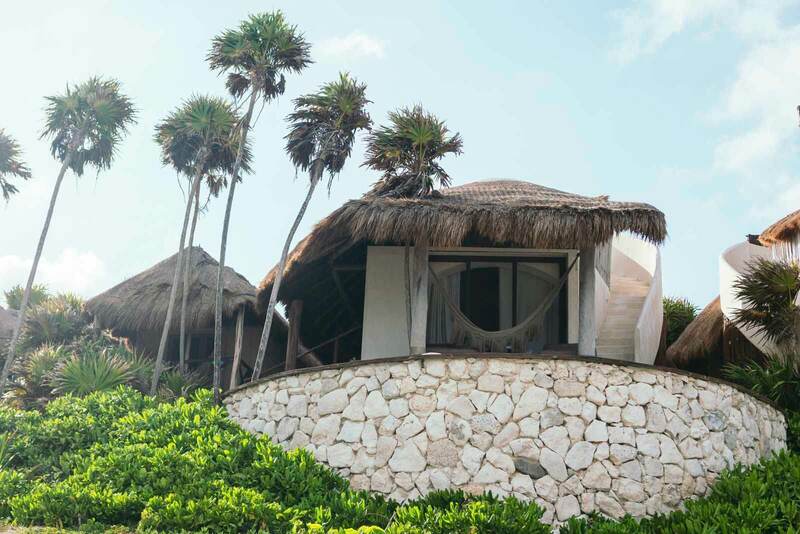 The rooms are located inside thatched cabins on the beach, this humble resort is just 1 km from the Tulum Ruins making it perfect walking distance to catch one of the coolest things to do in Tulum. The bathrooms are shared if you stay in a basic cabin, however, you can upgrade to a cabin that has private terraces and private bathrooms for an upcharge. You can rent boats, surfboards, and kayaks here. One of the best things to do in Tulum Mexico is stay in a hotel right on the beach. Habitas is an amazing luxury spot right on the beach. The hotel is right on the beach and close to all the best spots on Avenida Tulum as well as easy access to Tulum town. Located in the jungle of Parque Nacional Tulum for the perfect mix of beach and jungle. The rooms are in thatched-roof beach huts and come with outdoor rainfall showers. They also offer porches with swings with both jungle or ocean views! Besides being adorable and the perfect cozy tropical getaway, there is a pool, seafood restaurant, beach bar, spa, and yoga classes! Nestled right on the Caribbean Coast, this absolutely incredible beachfront resort in Parque Nacional Tulum. Each of the upscale rooms is located in thatched bungalows with island style decor. They have terraces overlooking the ocean and jungle as well as cozy seating areas with spectacular views. Some of the beach houses include 3 bedrooms and private kitchens! Staying here you have access to free parking, a full breakfast, access to the oceanside restaurant and bar, outdoor pool, and bike rentals. 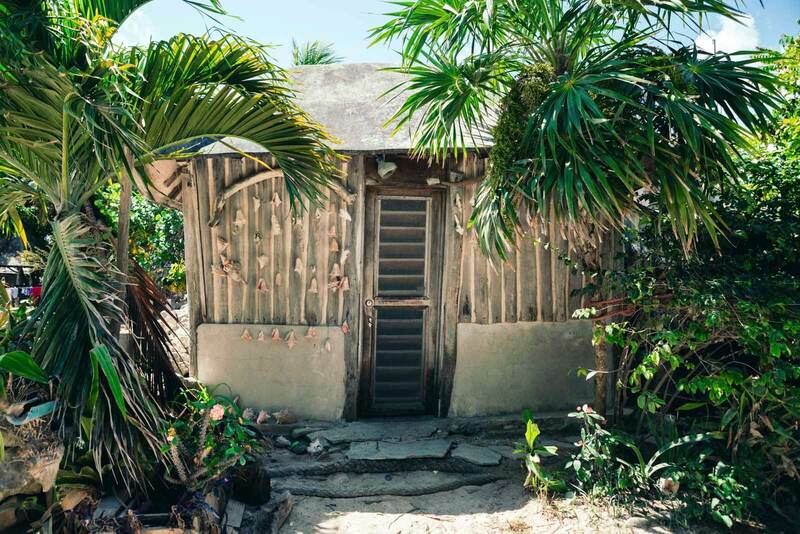 You can also check out some of the amazing Airbnb’s in Tulum Mexico! If you are a new user on Airbnb, you can get $30 off your first stay with this code. 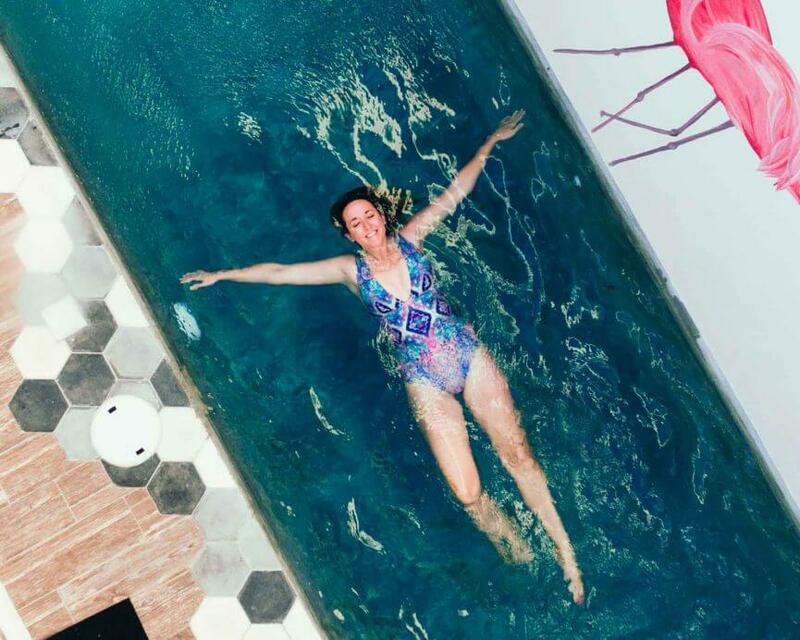 We stayed at Casa Flamingo during our stay and loved it! This three bedroom Airbnb is perfect for groups and has a fully equipped kitchen, a gorgeous pool, and hammocks to lazy around in. This is located in more of a residential neighborhood and is ideal if you have a rental car or don’t mind using a taxi service to get to and from the beach. We especially loved the artwork here! The best way to get to Tulum Mexico is to fly into Cancun International Airport (CUN), from here you can either rent a car and complete the 2-hour drive yourself or take a local bus. We recommend ADO bus company which has frequently departing buses. You can hire a private airport transfer from Cancun to Tulum. Renting a car at the airport is much more pricey than if you were to book a car from Tulum. 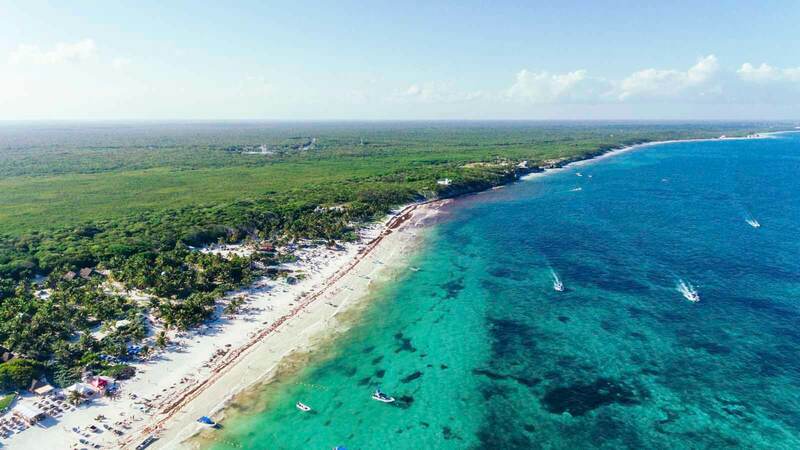 So we recommend taking the bus to Tulum Mexico, trust us Mexico buses are VERY comfortable and are like flying first class, and getting your rental car once you’re in Tulum. You do not need an international drivers license to rent a car in Mexico! Tulum is unlike the rest of Mexico where you can easily use Uber or any ride-share apps. If you don’t have a rental car or if you do have a rental car and plan on a night out, then you will have to use local taxis. It’s best to get a local taxi and ask for their number so you can call them to come pick you up whenever you need a ride. Or, you can just hail a cab when you need it. Taxis can be quite pricey! We were visiting over Easter weekend which would run about $6-$10 per cab ride! The inflated prices had to do with the high demand, but do not expect Mexico prices for a taxi! If you’re staying close to the beach be sure to check out the bicycle rentals! You can find a ton along Avenida Tulum. If you want to fully enjoy some of the best things to do in Tulum Mexico you will want to come prepared. Tulum is in the jungle along the coast, so you need to be prepared for mosquitos. Make sure you have insect repellent or you will be sorry! Also, the sun is hot down here. Be prepared and bring sunscreen. If you plan on going to cenotes you will not be able to wear regular sunscreen as the chemicals harm the environment. You will need to wear biodegradable sunscreen which is very difficult to find once you are in Mexico so we highly recommend purchasing it in advance. 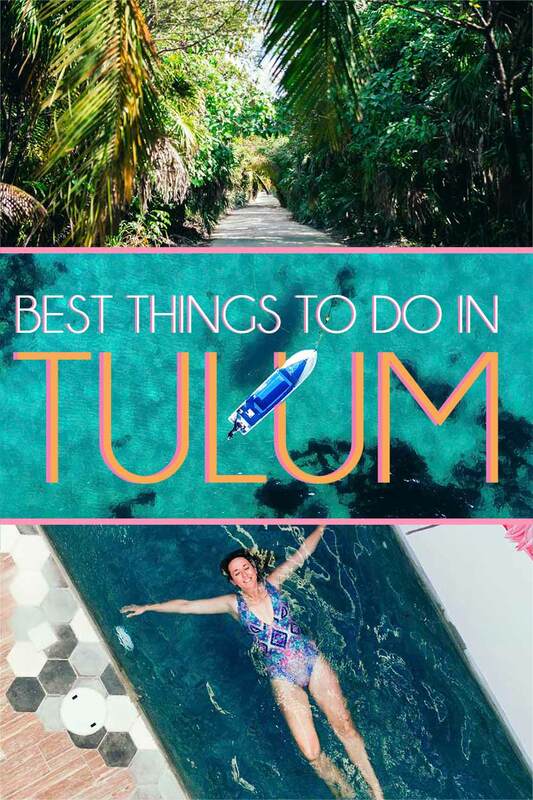 Liked this post on the best things to do in Tulum or found it helpful? 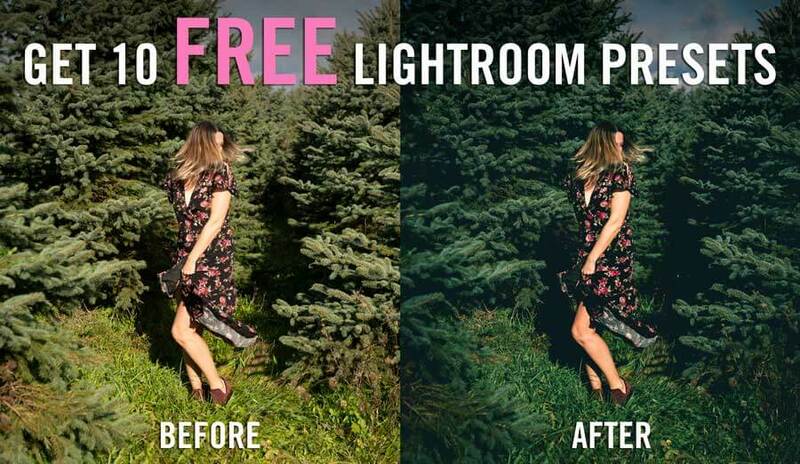 Share the love or bookmark for later on Pinterest below!